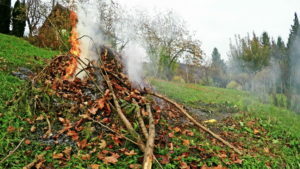 The burning of any waste is prohibited, except when written approval for such burning has been obtained from the Municipality. It is thought that common sense would prevail in such instances, particularly in light of the recent Veld Fires in our area. Herewith the Theewaterskloof Municipal By-Laws (Waste Management By-law) in respect of Solid Waste. Chapter 6, clause 39 is quite clear on burning of any solid waste.